Ah, the 90’s. You’ve just gotta love ‘em, right? We had Will Smith strutting his stuff as the Fresh Prince, Mr Blobby topping the charts at Christmas and kids fighting in playgrounds over Pokémon cards. Not to mention the genius that was SMTV Live and the emergence of two of the greatest actors ever seen on the silver screen: Kenan & Kel. It was a simpler time- and we often find ourselves wishing we could find little old Bernard, steal his watch and go back to relive it all over again. Or, you know, we could just re-watch all of these shows on Netflix, but that just doesn’t seem as fun. What really makes us want to go back to the 90’s, however, is the football. We had legends like Zinedine Zidane, Paolo Maldini and Gabriel Batistuta taking the world by storm, while sporting some of the most beautiful football kits the world has ever seen. Well, we thought we’d take a quick trip back to the years of Space Jam and Friends, and run you through our top 3 football kits of the 1990’s. It goes without saying that not everyone will agree with our list, so leave us a comment to tell us who you think we might have missed! The 1998 World Cup was a thing of sheer wonder. From Bergkamp’s absolute stunner against Argentina to Zidane’s double in the Final, this was a competition jam-packed with drama, big moments, and David Beckham kicking people. But the biggest thing to stand-out from World Cup ’98 were the stunning kits of the side that claimed a surprise third-placed finish- Croatia. Incorporating the colours of the Croat flag and creating a vibrant chequered pattern, this beautiful little number encapsulates everything that was so good about that particular World Cup. Designed by Lotto, it’s not hard to see the resemblance between the design of this kit and the famous coat of arms, so it’s fair to say the Croatians certainly didn’t lack pride. This is a Croatia kit that will take some beating at next year’s World Cup. Isn’t this just one of the most 90’s things you’ve ever seen? Designed by adidas, this dazzling, almost over-powering Arsenal kit is often considered something of a ‘marmite shirt’. 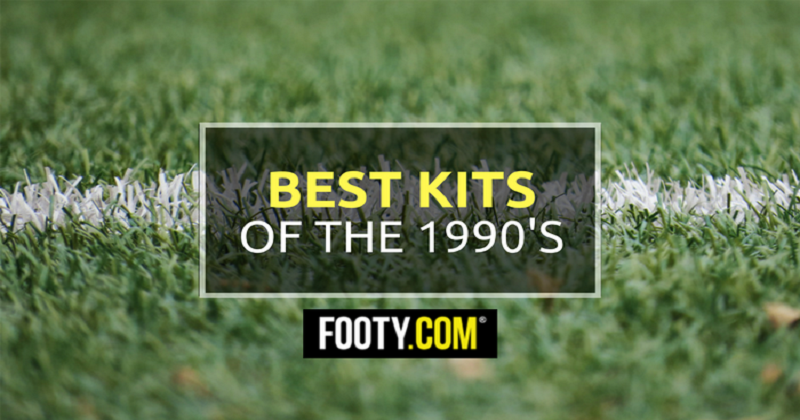 But whether you love it or hate it, you can’t deny the fact it’s one of the most iconic kits of the 90’s. Using a vibrant yellow colourway and a jagged blue pattern, it’s hard to ignore the fact that the Arsenal squad looked a little like tribal warriors of some sort. There’s an awful lot going on in this particular kit- and we absolutely love its sheer ridiculousness. Sitting top of the pile as the greatest football kit of the 90’s is the Newcastle United home shirt from the mid 90’s. With iconic players such as Alan Shearer, Les Ferdinand, David Ginola and *ahem* Darren Huckerby donning this particular design, it was always going to go down as one of the best ever. The strong black and white stripes have become synonymous with Newcastle United over the years (we hope Juventus fans don’t hate us for saying that), and they’ve never looked better than in this design. Bearing the infamous Brown Ale logo and some retro adidas branding, The Magpies enjoyed some of their most successful Premier League campaigns in this awesome jersey. But what’s your favourite? No matter whether it’s on this list or any other 90’s shirt, FOOTY.COM compare prices to find you the best deals on all kinds of football kits! Shop our collection today and start paying less to play more.